A deadly and seemingly impossible attack to counter is when a Muay Thai fighter grabs your head close to him and strikes you with his elbow. This is no uncommon. A skilful Muay Thai fighter may feint some initial attacks to get close enough to execute this formidable attack. An effective counter is “Fierce Tiger Crouching at Cliff”, which interestingly looks like a decorative pattern without combat function! Like other techniques, you must practice the counter many times to be fluent, so that when the occasions arise to use it, you can apply it spontaneously and correctly. Grandmaster Wong demonstrates a formidable Muay Thai elbow strike. An opponent grabs your head with one hand and strike your head with the other elbow. In Shaolin Kungfu this pattern is called “Black Crow Flaps Wings” How would you counter this deadly elbow stack? The size of the video clip is 0.42 mb. Steve attempts to counter the head grab elbow strike with the pattern “Precious Duck Swims through Lotus”. Grandmaster Wong explains that if the Muay Thai fighter grabs Steve's head at close quarters, it would be difficult for Steve to counter in this way. The Muay Thai fighter could also knee strike Steve's groin. It certainly is not an easy attack to counter. Steve tries to use other counters against the grab head elbow strike, but they are not effective. This shows that one must have the counter ready beforehand. It would be too late to try working out a counter during actual combat. 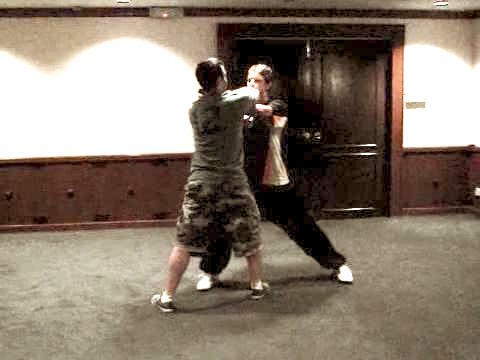 Sifu Roland offers an effective counter. But this is executed before an opponent has established his attack, i.e. before he has grabbed Sifu Roland's head. Grandmaster Wong explains that before the attack is established, there are many effective counters, like leaning back to kick and lowing the body to punch. 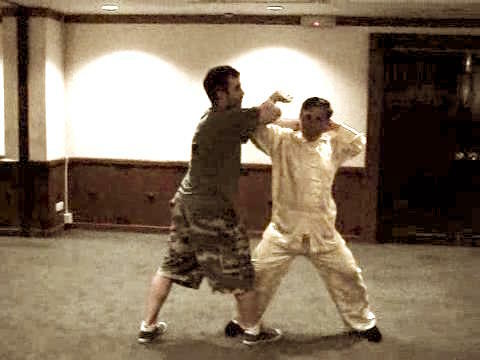 Sifu Zhang Wuji offers an effective counter by blocking the elbow attack with his forearm. Grandmaster Wong says that it is hard, meeting force with force, which may result in your fractured arm if your arm is not sufficiently strongly. It is better to deflect the attack instead of blocking it. The size of the video clip is 1.24 mb. 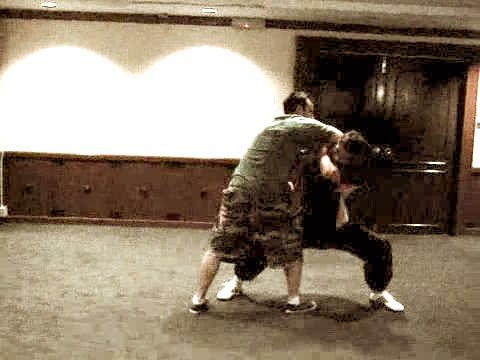 Crouching Tiger against Grab Neck Elbow Strike from Wong Kiew Kit on Vimeo.